While all you crazies were nursing hangovers on New Year’s Day, I was busily getting my Stepford on making THIS little kaleidoscopic dream. It’s a bit rough round the edges but be assured that the taste made up for it. It also took about 4 hours and my brother asked me if I had baking dyslexia. Don’t care. I’m awesome. 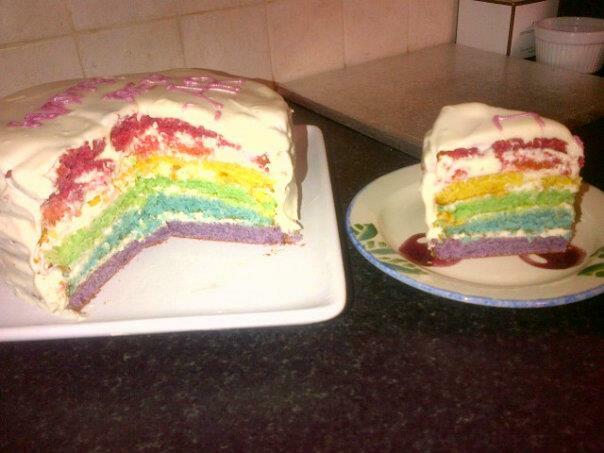 May your 2013 be just as colourful as my culinary masterpiece, although perhaps a little less mangled. Ha, ha! ‘Baking dyslexia’! I love your writing. That looks so yummy!! well done you! must have taken you ages! !